If you like dragons then this Dragons Live event at Wales’ largest castle is definitely the event for you! Why not head along and say hello to their friendly interactive dragon who will be taking regular strolls around the castle throughout over the May bank holiday. Head along and find out all you need to know about these magical, mystical creatures by meeting a Dragon Whisperer and asking for advice and guidance on how to train your very own dragons! Whether you consider yourself a Royalist or a Parliamentarian, this fantastic Civil War event at Caerphilly Castle is sure to delight this April! Yes, this Easter, the Marquess of Winchester’s Regiment of the King’s Army will be in residence at Caerphilly Castle with four days of battles, cannons and muskets. So why not head to this magnificent 750 year old castle and re-live the tumultuous and bloody times of the Civil War? You will get the opportunity to witness Roundheads versus Cavaliers (along with muskets and cannons), the changing of the guard, drill and a host of living history activities throughout the castle, as well as regular skirmishes between the Royalists and the Parliamentarians, with a detachment of dragoon guards and artillery men. This Easter, CADW invite you to head along to Wales’ largest castle and enjoy two hours of crafting fun in their Crafternoon sessions at Caerphilly Castle! There will be a variety of themed arts and crafts for Easter and are sure to entertain the little ones during the school holidays. These Crafternoons will be taking place on April 15, 16, 17, 18, 23, 24, 25, 26. If you fancy a taste of the medieval this Easter, why not head to Caerphilly Castle and experience these medieval siege engines in a 750 year old castle? This weekend will be full of fun and excitement as Caerphilly Castle give its visitors the opportunity to ‘travel back in time’ as they look to bring history with their fantastic mighty Siege Engines this April! Members of the medieval re-enactment group, Company of Chivalry, will be setting up camp in Wales’ largest castle for these two days of medieval fun. The huge siege engines will be fired by members of the group over the weekend, while visitors will be given the opportunity to have a go at firing a mini trebuchet made specially for the event. A great family day out for all ages. Whether you’ve got your lanterns ready or you’re excited about watching the magical glow of the beautful lanterns, you won’t want to miss Caerphilly’s infamous River of Light Lantern Parade this year. Especially, as this simply fabulous festive parade ends with a wonderful firework display that lights up our fantastic Caerphilly Castle! Participants will be accompanied by Samba dancers, Jazz bands and dancers creating a sea of colour through the town. Bring your lantern along and take part in this annual event. Enjoy some FREE family fun time and bring the children along to make a festive lantern ready for the Lantern Parade. The workshops will be an enjoyable experience for the young and old, children can release their creative abilities and adults get the chance to behave like children and really get stuck in! Christmas is a magical time of year. So, why not make it even more special this year by ice skating within the grounds of the beautiful and majestic Caerphilly Castle for the first time ever? Yes, this year Caerphilly Castle are offering the ultimate Christmas experience with the chance to go ice skating in their stunning grounds this November and December. There will also be food and drink available as well as lots of Christmas cheer and even the opportunity to visit Father Christmas himself during the Christmas Market weekend (tickets for this go on sale 1st November 2018).. 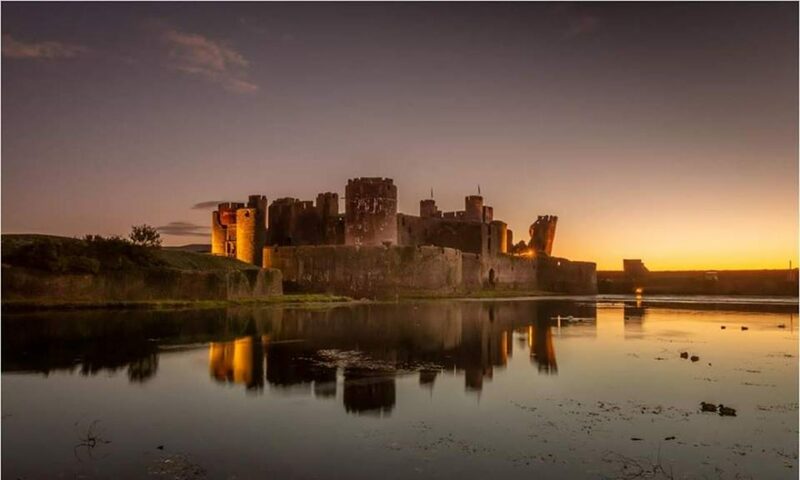 The wonderful opportunity to ice skate in this spectacular 750 year old castle will run start with the fantastic Caerphilly by Twilight event on the 23rd November and will run until 9th December 2018. These sessions run most days from 12-8pm on the hour and cost only £5 for children, £7 for adults and £22 for a family of four. Please see below for additional information. Tickets for the ice skating will be back on sale 10am Sunday 28th October 2018. Please click here to book tickets. Tickets to visit Father Christmas in his grotto on the 8th and 9th December will go on sale on the 1st November 2018. You do not have to pay admission to go ice skating. However, if you want to visit the rest of this spectacular castle, (past the area designated for the ice rink based just on the inside of the outer walls), you will have to pay. Children 3-7 years of age are permitted to skate when accompanied by an adult. Visitors in wheelchairs are more than welcome to enter the ice rink, but must be joined by a companion. Autism friendly sessions will take place on Sunday 2nd December at 10am and Monday, 3rd December at 12pm. There will be six penquins (skating walkers) costing £5 per session. First come, first served basis. Skate hire is included in the ticket price. Crepes, sweets, soft drinks, and beer will all be available to buy within the castle. The event will not be extended past the 9th December 2018. The rink is real ice. To book, simply please click here and select your chosen date and time. To visit Father Christmas on the Christmas Market weekend, please go here. Tickets cannot be purchased until after 1st November 2018. The award winning Winding House is always a popular visit, but did you know that on specific days you can watch the Engine Volunteers run the Victorian winding engine for members of the public? If you’d like to see this, then head along to The Winding House on the 30th June, where you will also have the opportunity to chat to volunteers who maintain the engine and ask them lots of questions! Our dedicated and enthusiastic Engine Volunteers maintain and run the engine for members of the public on specific days throughout the year. The engine runs for approximately 10-15 minutes. Please note, the engine no longer runs on Bank Holidays. Running the engine is dependent on the availability of our dedicated engine volunteer team. On very rare occasions, scheduled engine running times may not take place due to unforeseen circumstances. Please call us to confirm engine running times in advance of your visit. If you’d like to see this, then head along to The Winding House on the 28th October., where you will also have the opportunity to chat to volunteers who maintain the engine and ask them lots of questions!